Up to the first canopy platform - 40m up. It’s hot enough here that the rain sprinkling onto our beds during a night of thunderstorms was not a real problem. Well, apart from when Declan woke up screaming that he was covered in ants thanks to the raindrops. This morning we went zip-lining through the jungle canopy. In theory there is a variety of animals and birds available to be sen in the canopy. I must admit though that all of our fair-ground screams meant we saw very little. The zip-line starts about 30 m (90 ft) up on a huge kapok tree. You zip from there to another tree, then swap lines and zip on another stage, and then finally abseil down to the ground. 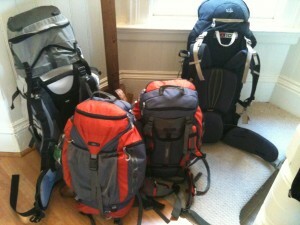 It was a splendid experience and far less scary than I feared – the worst of it was getting up the first tree. Callum, of course, had real issues with it but mastered them wonderfully; Declan had to be restrained from just leaping off Tarzan-like. We did see a vulture, some fly-catchers and macaws as well as a variety of insect-life. Lots of insects in fact. The jungle floor here is largely clay and thanks to the rain had formed a lovely, sucking, viscous muck that dragged at our boots as we walked along and required a focus on the ground. The positive thing about that was that we managed to spot some interesting insects without our guide’s help. 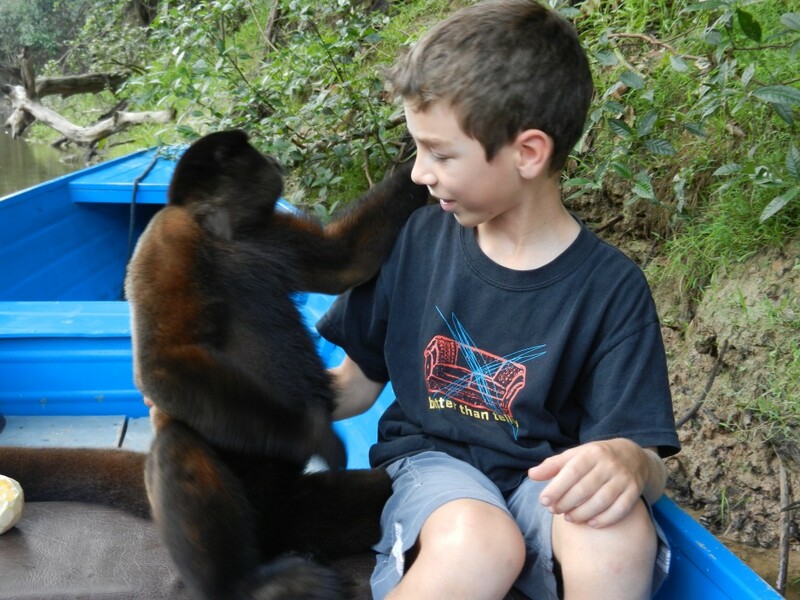 In the afternoon we went to visit Dorilla, a woolly monkey who was rescued from illegal animal traders when young. Dorilla now lives in the wild but has not found a group to join so she’s very friendly to humans. We got to feed her and then she played with us in our boat. Apart from being friendly we were struck by how soft her hands and feet were as well as the inside of her beautiful prehensile tail: all particularly obvious as she climbed all over us. The trip to meet Dorilla took us down a lovely small river with tons of bird-life all around. We saw kingfishers, ibis, herons, hawks and eagles as well as tons of smaller birds. And we also saw people in the most unlikely places. You’ll turn a corner and there will be a small thatched hut on stilts in front of which is someone washing their hair or washing their clothes in the river. These people are small farmers and hunters and occasionally you’ll see a long boat going down the river with a small load of bananas or something and the entire family draped over it. We made our way back from our visit to Dorilla as the sun started to set. The boat and ourselves all smelling of monkey, and wide grins plastered all over our faces. 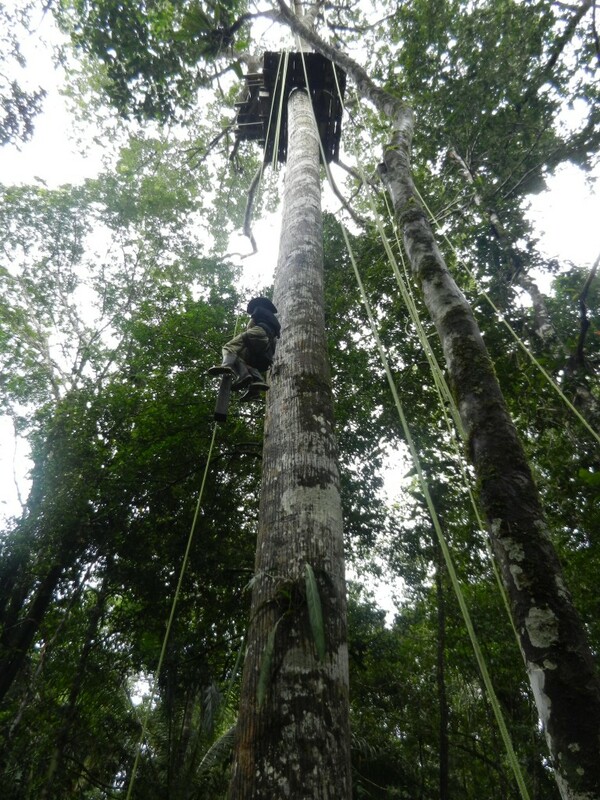 Up to the first canopy platform – 40m up. Jennifer abseiling down at the end.